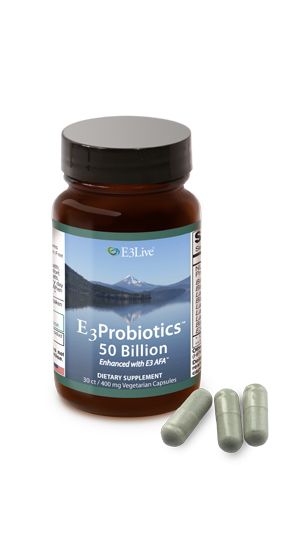 E3Probiotics 50 Billion Enhanced with E3AFA® is 100% guaranteed. 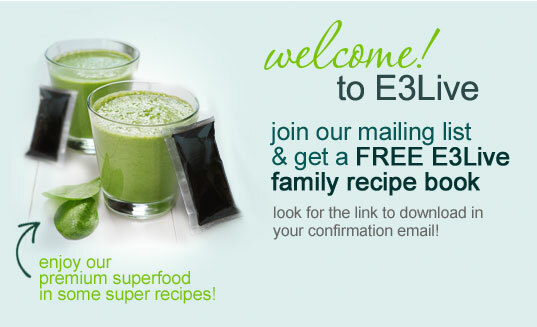 E3Live offers a one year guarantee on this product. We believe in your full satisfaction. Learn more. NEW & IMPROVED with 50 billion active cultures per capsule. Be sure to read testimonials from Athletes, Health Experts, Clients about Animals & Pets, and many more. Please note: Testimonials from enthusiastic users and news articles are for your information only. E3Live, any retailer and/or distributor of this or any E3Live product make no health or medical claims for the use of this product. If you have any questions or medical conditions, always consult with your medical professional. Your results may vary from the testimonials provided. Take 1 capsule, 1 or more times per day on an empty stomach. Best taken before bedtime, or 1 hour before, or 2 hours after meals. E3Probiotics 50 Billion Enhanced with E3AFA®—our all natural, non-GMO, herbicide and pesticide free probiotics are formulated to assist your body in gut health, gut swelling and immune health. Beneficial intestinal floras can be depleted by the diets high in sugar, meats and low in fiber, or by medication taken for illness and infections. This may result in a disruption of your normal intestinal microflora. When normal microflora is disrupted it can affect your well being and digestion. 50 Billion Count Bacteria with E3AFA added into the blend in a Delayed Release Acid-Resistance Vegetable Capsule. Vegan and gluten-free. Vegan, non-GMO, gluten-free, no refrigeration required. NLT 50 Billion CFU Proprietary Synergistic Blend: Inulin, Bifidobacterium bifidum, Bifidobacterium lactis, Lactobacillus salivarius, Bifidobacterium longum, Lactobacillus rhamnosus, Lactobacillus plantarum, Lactobacillus lactis, Bifidobacterium breve, E3AFA. Other Ingredients: Vegetable cellulose capsule (HPMC, water). Delayed release acid-resistant vegetable capsules. These probiotics are the best, they keep your intestines healthy! I did not think that I noticed a difference in this product until I ran out of the caplets. Now I can feel the difference when I was taking it and now. It helps you from feeling bloated. I am reordering this product! Whenever I have a groggy system this clears it imediately and I feel so clear in mind and body! I really love this product. My belly feels great when I use it. Do the Probiotics need to be refrigerated? No, our new Probiotics do not need to be refrigerated. * These statements have not been evaluated by the FDA. This product is not intended to treat, prevent, diagnose or cure any disease. This product has not been approved by the FDA.